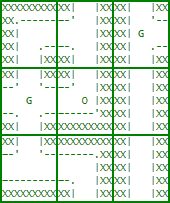 The Pattern, released on April 29th, 2014, is a minigame within the game TerrePets. The Pattern is an ever-expanding grid where Residents can navigate and place Maze Pieces to create new pathways and obtain new items by destroying obstacles. They can be obtained from the Pattern Shop, the Maze Piece Combiner, through trading with other Residents, and as Pattern rewards for destroying obstacles. The Pattern Shop, accessed from Shop tab on the Pattern page, is a service that allows you to trade various items for random Maze Pieces. The shop accepts the following items: Amethyst Necklace, Bone Flute, Dreamcatcher, Emerald Necklace, Feather Headdress, Leaf Charm Necklace, Lemon Tart, Mushroom, Ornate Vase, Pretty Pebble, Stone Arrowhead, Wooden Chair. The Maze Piece Combiner, accessed from Combiner tab on the Pattern page, is a free service that allows you to combine multiple different Maze Pieces to create a new piece with all the openings of the original pieces. For example, combining a Maze Piece (ES) with a Maze Piece (SW) would produce a Maze Piece (ESW). The Pattern's map is the same for everyone - it's shared and explored by all players at the same time. When you (O) first enter the Pattern, you'll be placed at random coordinates on an existing path. To move, click one of the four directions (north, east, south, or west). Alternatively, you can move by using the arrow keys ⇦ ⇧ ⇩ ⇨ on your keyboard. 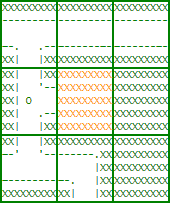 You can select the Overview tab to view a 30x30 tile overview of the area surrounding your current Pattern position. You can only do this once every 24 hours. Only the Maze Pieces (EW) and (W) can be placed in the orange area - no other piece fits in the space. You can't see where the other players are in the Pattern. To create a new path in the Pattern, you must have a Maze Piece in your house. You can only place the Maze Piece in an unoccupied space if it doesn't block surrounding paths. Once a Maze Piece has been placed, it can't be changed or removed. After placing a Maze Piece, you will find an obstacle (X) on the new path. Players can't move onto the new path until the obstacle is cleared. To clear the obstacle, you have to obtain a randomly selected item, which will be destroyed to clear the obstacle. The item is chosen from items currently priced below 1000 money in user stores. Clearing the obstacle will reward the player with one of 23 items. Once you have obtained the requested item, moving onto the obstacle will remove the requested item from your house and you will receive a Pattern reward. A user-made list of current obstacle locations is here. This list might not be up to date. Clearing a Pattern obstacle will reward you with one of 23 items. One of the rewards, the Magic Ticket, can only be obtained from the Pattern. For a list containing all Pattern rewards, see Category:Pattern reward. Halloween is a seasonal event which lasts from October 27th until October 31st. During the event, Pattern ghosts (G) randomly spawn in the Pattern on existing paths, requesting a random item in exchange for a random reward. The ghosts disappear after the trade. Helping 20 ghosts will grant you the Ghost Whisperer badge. The ghosts are not visible on the Pattern overview. All ghosts will disappear when the event ends. As you move through the Pattern, your eyes catch movement in the shadows along the wall. As you watch the shadows, a dark, ghostly figure solidifies and moves towards you. As it approaches, you hear a whisper being carried on the winds... "Traveler... I seek your help... I seek freedom.... Trapped... I wander... no escape.... Help me! ... I need Rusty Nails to free myself ... "
Give the ghost what he needs. You hear on a whisper once more... "Thank you... take this..." The ghost fades back into the shadows, leaving behind Candy Apple. This page was last modified on 24 February 2018, at 21:38. This page has been accessed 18,963 times.